Abbey Stadium or R Costings Abbey Stadium for reasons of sponsorship is the home ground lower league side Cambridge United F.C. First opened back in 1923, the 9,617 capacity ground today has just under 5,000 seats with the club’s management only looking to convert the stadium into all seater if the Cambridge are promoted to the Championship. 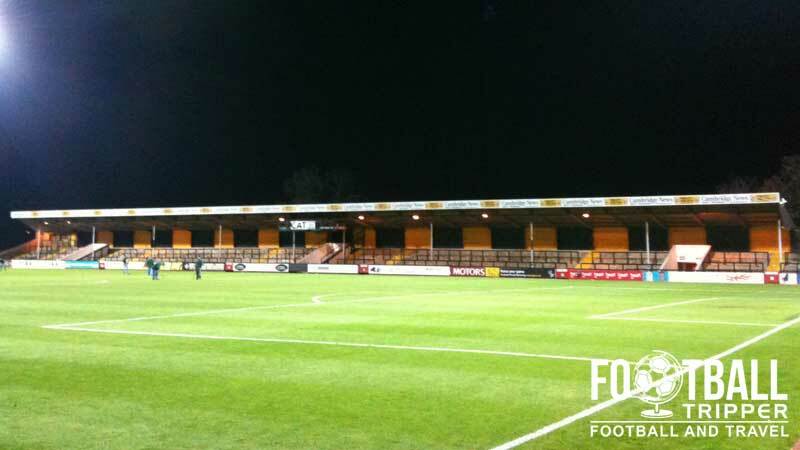 Cambridge United’s stadium is named after Abbey United, the club which was later to become Cambridge United in 1951 with the ground first opening in 20 years previously. Constructed near to the site of the former stadium known as Celery Trenches, the land was donated by former Club President, Henry Francis. Initially Abbey Stadium consisted of just a single grandstand and changing rooms when the first fixtures against Cambridge University Press was hosted in August 1932. At the peak of the club’s on-field performance during the 1991-1992 season when Cambridge were on the cusp of promotion to the Premier League, plans were made to expand the ground which would have included an 86 bedroom hotel, retail space and new club headquarters. If it wasn’t for financial difficulties coupled with the club’s poor performances on the pitch for the next four seasons, the club may well have pushed onto the next level. Instead they languished in the lowest division of the football league with little work carried out on Abbey Stadium since. Further financial difficulties meant that the land originally donated to the club by a generous benefactor was sold to then club director John Howard’s company in December 2004. It was leased back to the club with a repeat of this scenario in 2010 when the ground was sold to Grosvenor Estates for £3.5m although this resulted in a reported lower annual rent reduction. 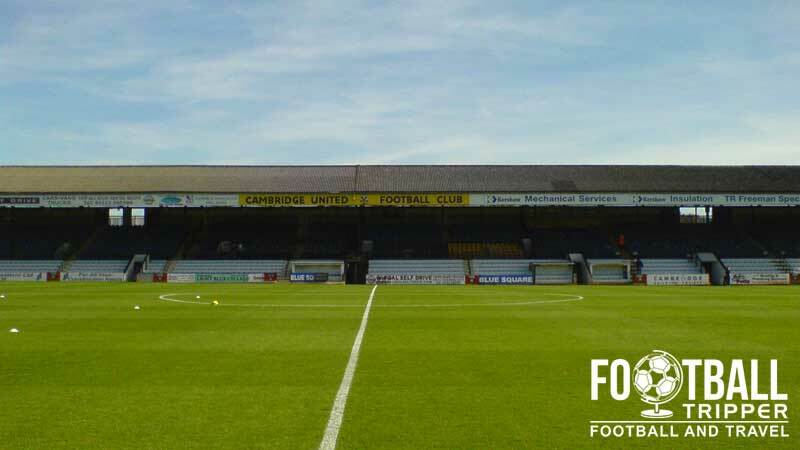 With club directors stating that it is their intention to keep standing terraces for as long as the Football Association will permit, it is no surprise that the club’s supporters have launched the Cambridge Community Stadium Trust which aims to restore ownership of Abbey to the club itself. From 2009 onwards the ground has been known officially as the R Costing Abbey Stadium after a St Ives based legal firm purchased the naming rights. Some of the proceeds were used to refurbish the front of the stadium with the club’s offices which are housed portakabins being reclad to improve first impressions of the ground. The four stands at Abbey Stadium are as follows: Main Stand (East) which is two tiered and all seating, The Marston’s Smooth Stand (South). 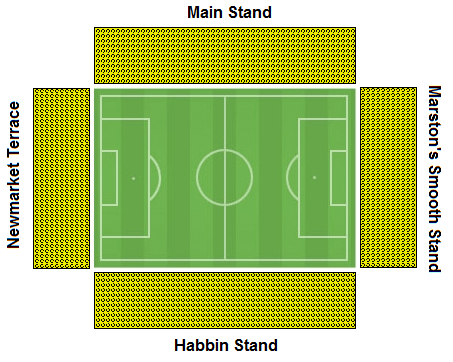 the newest stand, The Habbin Stand (West) which is terraced and lastly the Newmarket Terrace which is behind the northern goal. The ground feels old school in the sense that there are four separate stands of various sizes which aren’t filled in at the sides – a defining characteristic of English Stadiums in the 20th century. For those making the trip, there seems to be a better feeling of unity in the centre of town on matchdays as there’s just the one team in the city unlike in Oxford. 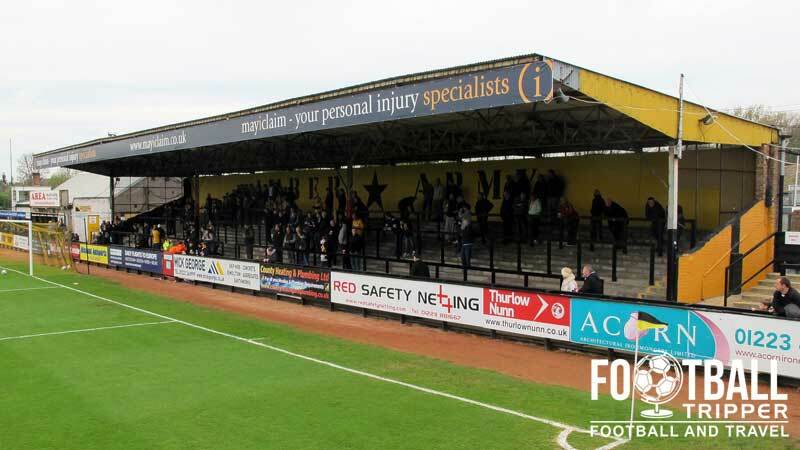 Away fans are usually housed in the south stand known as The Marston’s Smooth Stand which is an all-seater affair with a capacity of 1,600 – something which is quite uncommon within the lower leagues of English Football. Turnstiles for the south stand are well signposted throughout the ground, and for selected games where the away contingent is expected to be larger than usual, fans can be accommodated within the Habbin Terrace to the west. This is adjacent to south stand and usually has enough capacity to host 1,000 supporters, although the away allocation will be the smaller share. The entrance to the away stand is located along a path through the common field which is invariably inhabited by Cambridgeshire’s bovine population, and once you are in the stand you will have decent views of the game with the stand being relatively modern. Next to Abbey Stadium is the Supporters Club bar which is usually open to both sets of fans (Check the official site for high-profile matches) and is well stocked with a variety of beverages and reasonably priced hot and cold food options. Costing £1.00 for match day entry this is probably the best place at the stadium to grab a prematch pint although it can busy leading up to kick-off so it is advised that you get there as early as possible. Fans of the club mourn the closure of a number of local pubs around the stadium with The Wrestelers Pub on Newmarket Road probably the most accessible save for Cambridge town centre where there is a large Weatherspoons amongst other watering holes. Outside the stadium there is the popular chip shop, “Mr Chippy”, which is located on Newmarket Road. This can be reached by turning left from the front of the ground, and less than 10 minutes in the opposite direction there is a McDonalds. Inside the ground, there is the usual range of burger vans, and fast food football options including, if the club’s official website is to be believed, “award winning” bacon rolls. These were apparently reinstated after a period of extended absence when fans of The U’s protested, so help keep the demand up and give one a try! Cambridge United’s club shop is usually open during the week Monday to Fridays from 9.30 am – 4.00 pm, and on match days a few hours before kick-off. The club advises that you phone them on (01223 566500) to ensure that you have the latest information regarding opening times, and availability of stock. The Cambridge shop is located in a shed…proper lower league stuff. It doesn’t appear as if Cambridge United currently offer fans the chance to undertake a stadium tour of Abbey Stadium. If this changes, we’ll be sure to update this section. 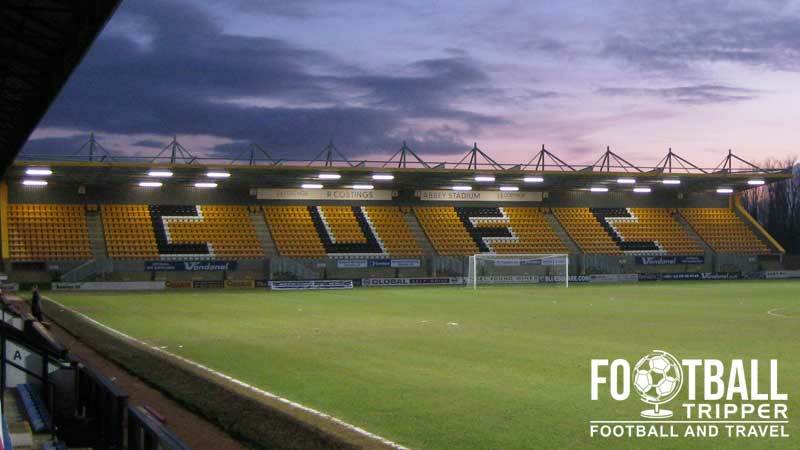 To purchase tickets you can either phone the ticket office (01223 566 500), visit it in person at the Abbey Stadium (See club shop for opening times) or book online via Cambridge United’s E-Ticketing facility. Cambridge United’s stadium is located approximately 1.7 miles north-east of the historic city centre along Newmarket Road (A1303). The entrance sign to R Costings Abbey Stadium. Cambridge Railway station is located in the south-eastern part of the city exactly 1.8 miles from Abbey Road Stadium which leaves fans with a walk likely to take anywhere between 25-35 minutes depending on your levels of fitness. Head away from the station along Station Road and take the first right onto Tenison Road. Take the first right again onto Devonshire Road, follow this round to the left and up to the next junction. Turn right onto Mill Road and proceed over the railway bridge. Then take the third left onto Sedgewick Street and follow this road to a T-junction where Coldham’s Common is. Enter this field and follow the path under the railway bridge to the away turnstiles. The Citibus C3 departs every 10 minutes from outside the train station with the Ditton Walk Stop effectively taking you right outside the ground. Travelling through the city centre and taking anywhere between 15-20 minutes it is probably the best way to get to the stadium with the exception of the Taxi. For a detailed timetable and to check if the service is running on the day of the match you can visit Stagecoach’s website and type Cambridge Citi 3 route in. One Cambridge FC Fan holding a scarf and displaying the club’s colours. Parking around the ground is extremely limited with the left hand side usually reserved solely for the use of coaches. If you are disabled and require a space then you can contact the club on 01223 566500 or send an email to [email protected] to request assistance. The closest hotel to the stadium is the Travelodge on Newmarket Road which is Westwards towards the city centre. Besides this there really aren’t too many other options nearby, although the city of Cambridge itself has has plentiful options.